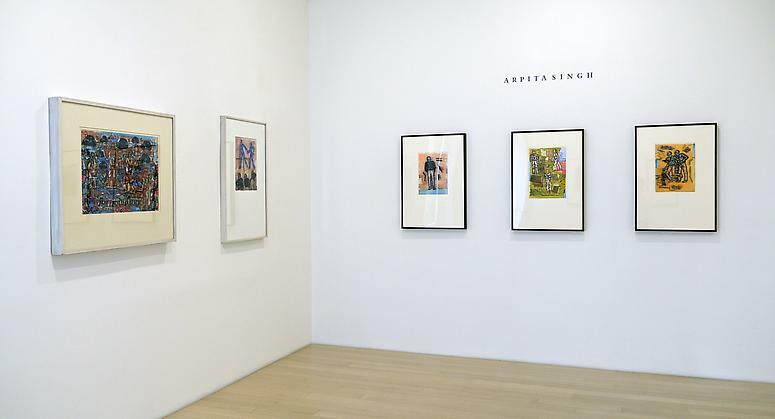 New York: Arpita Singh’s vibrant watercolor works on paper, currently on view at the DC Moore Gallery in New York, are a departure from her signature portrayal of women. Here men take center stage, often in an uneasy stance, caught in the crossfire of urban chaos and unease. 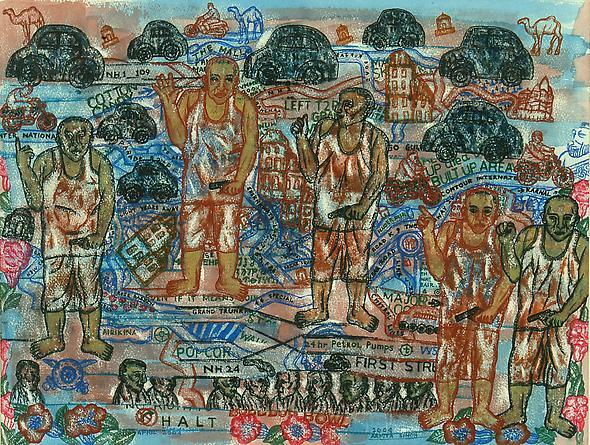 Singh subverts the conventional heroic male by depicting a slew of men plagued by the overbearing metropolis filled with snaking highways and packed motorcades that bombard the human mind with too much noise and pollution. In Cain (?) The Wanderer, 2012, a lone figure in threadbare Gandhian garb traverses the urban landscape. Much like his biblical counterpart, who is shamed for killing his brother and compelled to be a wanderer, Singh’s wanderer too is bereft and alone. Yet the simplicity of his appearance makes us question whether in fact he is truly ill-equipped for the modern world or if his bare upper body, stripped of cover and pretention, attains a mysterious alchemy of strength to face the world. 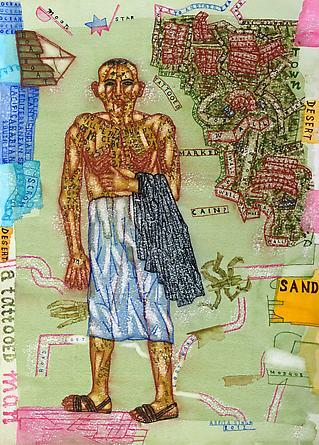 The text inscribed on his body and the surrounding environment alludes to Singh’s cryptic, deeply personal worldview, often difficult to decipher. Is her wanderer a ruthless modern day Cain, or is his Gandhian facade emblematic of forthcoming quietude? Multi-layered and symbolic, Arpita Singh’s work is a complex configuration inundated with allusions to mythology, popular culture and current events. phalluses implying a sense of impotence in their roles as guardians of their environment. 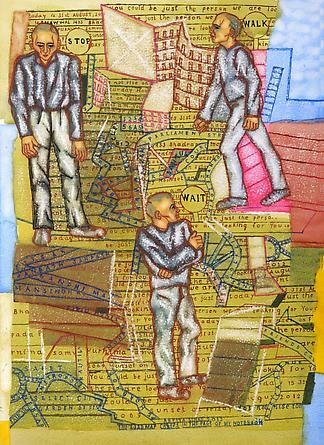 The grid like formation, and the text in the densely populated cityscape that form the background of this painting, become important signifiers of a dangerous world fraught with tension. Singh’s men are caught in a current of urban disquiet where their internal psychic condition is reflected in the jarring quality of the external space thereby blurring the boundaries between internal and external, public and private, conscious and unconscious. The inner space of their minds cannot be separated from the external din and danger of the streets and highways. Her male figures appear weak and vulnerable in the face of an outside threat, making a mockery of their manhood. But like the protagonist of the previous work, we are left to wonder if their simplicity points to ineptitude in a complex world, or a blessing in disguise. In Untitled, 2010, and The Roadmap Creeps in the Page of my Notebook, 2012, the flat grid like structure appears as a leitmotif against which Singh places her figures, numbers, and words. Inspired by a label from a tea carton, the flat surface was conducive to her meticulous art making process of layering colors that resemble thick pastel, such that her watercolors appear saturated with pigment and tone. 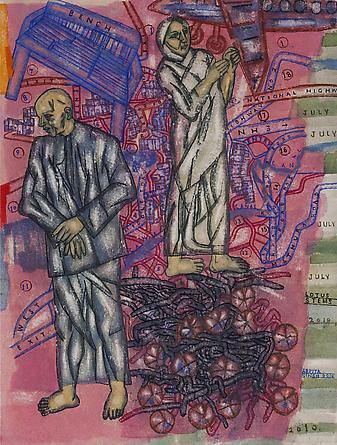 Through these rich tapestries dense with imagination and experience, Singh depicts a world steeped in anxiety with a sliver of hope towards a future of some peace and resolution.